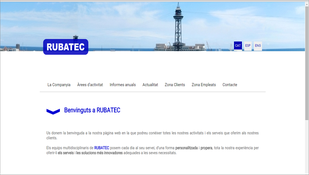 To improve communication towards our customers and update our online presence, RUBATEC has renewed its website to update the structure and its contents. In the new website can be found the business areas of the Company and the main references executed in recent years. We also have incorporated the News area that will inform about current major news of RUBATEC. In the same way we have improved the Client Area where you can access, with previus authorization, to the main management platforms that we provide our clients. Finally it's also incorporated an area where RUBATEC employees would receive internal information of the Company.